Mast height is 69ft off the water... He allows 71ft to cover the antenna and lightning rod. Insulate Under Forward Cabin Berth For Noise Reduction From AC Unit. The arrangement plan for the 4700 features a three cabin, two head layout. Both the forward and aft staterooms berths are queen sized and each cabin has a head accessible from the cabin. Both heads include a stall shower. The starboard crew cabin is fit with upper and lower single berths that kids will love. The onboard cook will appreciate the ample space allocated to the galley; a double sink, large front and top load icebox, 4-burner LPG stove and large storage areas. Taking full advantage of the raised coach roof, extensive ventilation, light and airy are the best descriptions for the main salon and navigation station area of the boat. Whether it's long weekends aboard, summer cruises or offshore destination cruising, the 4700 can be tailored to satisfy your sailing lifestyle. The 4700's deck features wide side decks, extensive ventilation in a wide array of stainless steel port lights and hatches, and a large and comfortable cockpit with all sail controls led aft for sailing convenience. Tartan owners put sailing performance first, and the 4700 deck plan is optimized to allow her crew to efficiently tweak sail shape and trim from the security of the cockpit and helm areas. Her all chrome winches and polished stainless hardware are from the best suppliers in the industry. Few yachts can match the ventilation of a Tartan and the 4700 continues the theme with 12 opening port lights and 9 deck hatches. Dockside or sailing, the cockpit is the center of on board activities, rack and pinion steering, long contoured seating and a walkthrough transom platform provide comfort and convenience. Efficient sailing performance is at the core of every Jackett designed Tartan. The new 4700 has been fit with the CCR sail plan, which was originally introduced on the Boat of the Year award winning Tartan 3400.. 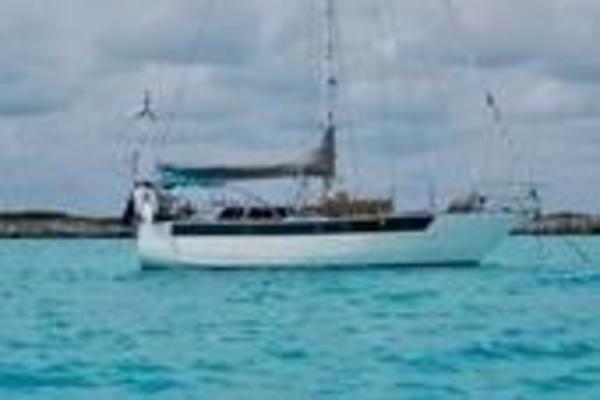 The rig features a tall fractional working sail plan with a self tacking jib for upwind work and a masthead 155% reacher for great off wind performance. A carbon fiber pocketboom with integral lazy jacks and sail cover help tame the main, while still allowing the sail maker the latitude to build a fully battened, high performance mainsail. Of course a large sail plan requires great stability, and the all lead bulb keel and light and strong carbon fiber mast combine to provide excellent sail carrying ability, a high range of positive stability and a sea kindly motion offshore.